August – we know we need a new kitchen but we really don't know which company to turn to for help! We've wasted hours trying to design one ourselves. We're pretty sure we would like an induction hob & we've seen a Siemens one that ticks a lot of boxes. Local showroom at Kitchenology in Bury St Edmunds – time to go and ask some questions about induction cooking…. 2 days later – Jennifer spent a lot of time with me explaining how induction hobs work and she let me play with the hob in the showroom – I'm sold! We've had designs drawn up by Jennifer (much more to our taste than other companies came up with) and she has spent hours with us – patiently answering all our (sometimes nerdy!) questions and tweaking the designs to accommodate our requests and specific needs. She even arranged for me to go and see a local customer who told a very reassuring story of how Kitchenology operate and the standards of workmanship. Their kitchen looks really good too. Tim came round to do his technical survey – good to know that we wouldn't have to get involved with project managing any aspect of the job ourselves and that Kitchenology could do (or arrange) all the work for us. Finally getting round to pricing – and the price is competitive – especially considering the quality of the units and appliances we are having. The price genuinely appears to be all-inclusive & we do not expect to receive any additional bills unless we ask for extra work to be done or change our minds about fittings at the last minute. 9am – the van rolls into the drive & Tim, Jon & Joe are here – confusing mix of excitement, anticipation and trepidation. 5pm – all the kitchen (including the ceiling) has gone and there is just a huge space waiting to be filled. Impressed that they've taken the time to clear up and not leave us in a complete mess. 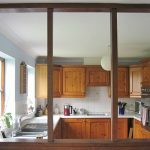 French windows in – what a difference they make. Very pleased that they are spending a lot of time asking exactly where WE want things to be (rather than making assumptions) and are helping us make sensible decisions about position of lights, sockets etc. Mike and Dan the plasterers have done their stuff. Looks like a good job although the kitchen looks like a dark and dingy cave at the moment with wet plaster on the ceiling as well as all four walls. Some of the units are now fixed into place & we can start to get an idea of how things will look. .
All units are now in place and we've had work done in the utility room to make a very useful floor to ceiling cupboard, box in some pipes, rearrange appliances and fit a new worktop & sink – all looks good – will be even better when we've some electrics and lighting! At lunchtime today Tim arrived with Paul & co to fit the worktop. Very pleased with how the room is looking – more spacious and light. Full team today for a big push to finish off as much as possible. By 6pm all the electrics are working, all the plumbing is done & we have a working kitchen!!! Celebratory bottle of champagne placed in the fridge by Tim – very kind, we shall enjoy that. Flooring fitted – the kitchen looks really good. Just need to get Tim back to refit plinths because some of them might need to be trimmed. The kitchen is looking great and functioning really well. Having a new kitchen fitted is always going to be a disruptive affair with a few roller-coasters of emotions or doubts along the way. Kitchenology made the whole experience as easy and as painless as possible – from an unpressurised sales approach, through a highly receptive and inclusive design process to a careful, professional, attention to detail installation package – we have found it hard to fault them. 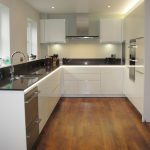 A couple of potential problems arose during installation but Kitchenology scored very highly by listening to our concerns, acknowledging the issues and then taking prompt action to deal with them to our full satisfaction. Oh… and the price really was all inclusive!